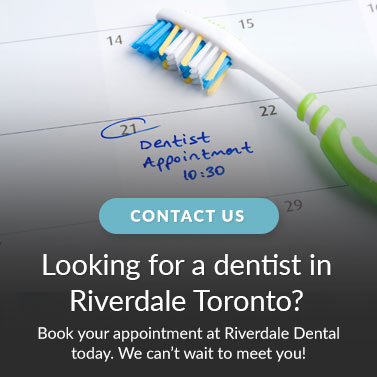 Dr. Dara Lee, our periodontal dentist at Riverdale Dental in Toronto, provides bone augmentation services for patients who will undergo dental implant treatment. You may lose a tooth for a variety of reasons. If you have gum disease, have a tooth infection, or experience an injury, you may require tooth replacement. When x-rays show that there is inadequate bone volume, your dentist can often increase the bone quantity by a variety of procedures. Bone augmentation can involve grafting (adding) bone or other materials to the needed area. The area will then take several months to heal and fuse with your existing jaw bone. After the healing, your dentist will then place the implants in your mouth. Why might I need bone augmentation? If you have lost a tooth, and require a dental implant, your dentist will need to evaluate if there is enough bone to perform this procedure. This is because when an implant is placed in the bone, it is very dependent on both the quality and the quantity of the bone. Quality of bone refers to how dense the bone is. The lower jaw bone tends is more dense than the upper jaw bone. The quantity of the bone has to be considered in all three dimensions: height, width and depth. There has to be an adequate amount of bone in each of these dimensions to hold the implant. This is typically determined by x-rays. There is also a risk of failure of bone grafting.